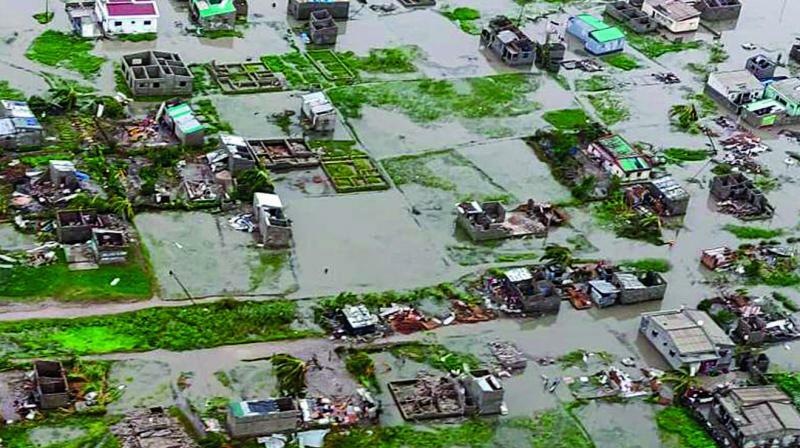 Beira (Mozambique): Rescue workers in Mozambique were racing against time to pluck people off trees and rooftops Tuesday after a monster storm reaped a feared harvest of more than 1,000 lives before smashing into Zimbabwe. Four days after tropical cyclone Idai made landfall, torrential rains and powerful winds, combined with flash floods that have swept away roads and bridges, inflicted further pain on the two impoverished countries. More than a thousand people are feared to have died in Mozambique alone while scores have been killed and more than 200 are missing in neighbouring Zimbabwe. Emergency teams in central Mozambique set off in boats in an inland sea of floodwater, nabbing survivors from treetops and roofs, even in the dead of night. The South African military and the Mozambican army have deployed their air force in the effort to save lives, while a South African NGO called Rescue SA said it had saved 34 people since Friday night, using three helicopters. It is striving to hire more. “It is the only way to access the people that are stranded,” Rescue SA’s Abrie Senekal told AFP. Its team is having to make potentially life-or-death decisions about whom to save, the organisation’s head, Ian Scher, told AFP. “Sometimes we can only save two out of five, sometimes we rather drop food and go to someone else who’s in bigger danger,” he said. “There’s two issues at the same time: people stranded in trees, and people stranded on houses or new islands that have no food,” he explained. “Communities are isolated and bodies are floating” on the waters, he said, as he reported 84 deaths so far. “Some dams have broken, and others have reached full capacity, they’ll very soon open the flood gates,” she said. The most affected area is Chimanimani in Manicaland province which borders Mozambique. Families started burying their dead on Monday in damp graves, and survivors with injuries filled up hospitals, according to an AFP photographer. Rescuer Scher warned that “there’s going to be a large amount of dead people, the locals and the international community don’t even realise it yet but it will be huge”. Britain on Monday said it was giving six million pounds in emergency aid to Mozambique.